the very first thing i do in alpha convention. Light and Mist of Yuan Yang by Steve Chong. Dragon and Rabbit. 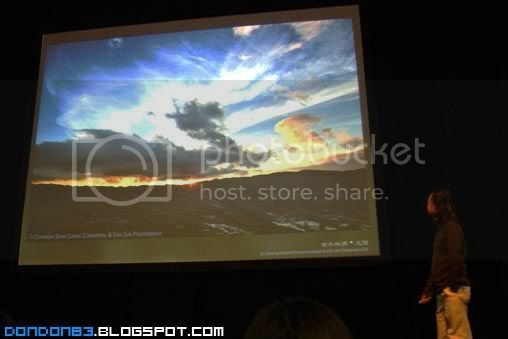 the Dark cloud on the left shaped like a dragon and the golden cloud shine up bu the sun shaped like a rabbit. together.. it form a fine piece of art. 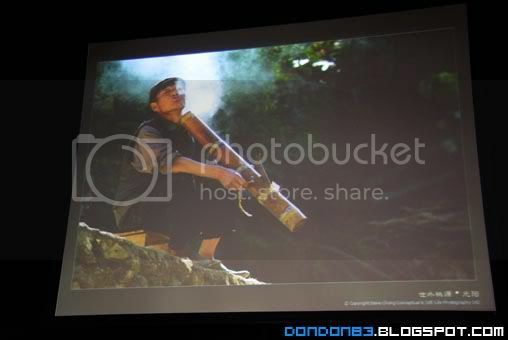 Continue with Steve Chong Light and Mist in Yuan Yang and Grant Corban the famous Wedding photographer. 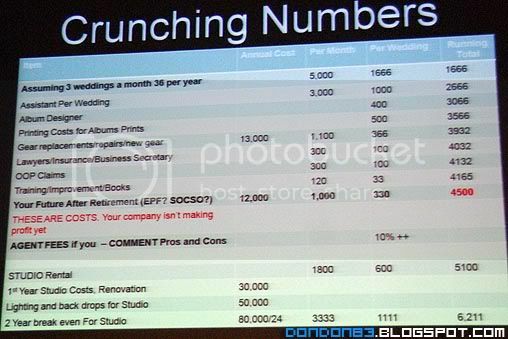 Grant Corban were talking about "Wedding Photography and the business" explaining on how come calculation works before you quote the price. a list that telling how to price your wedding correctly.. 4.5k is the cost only.. of course.. if you have complete set with you. 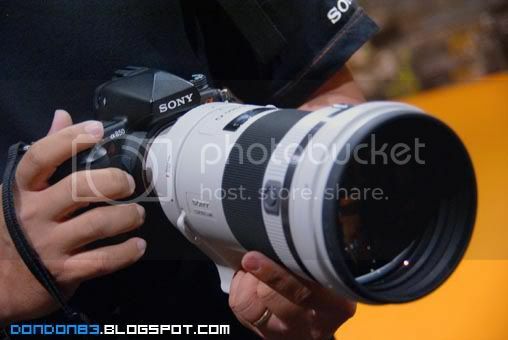 which is 2 unit flagship dSLR, 1 set of Trinity Lenses (from 17mm to 200mm f2.8) . take 2 years to break even for charging their RM6211 per client. photography really good business?? 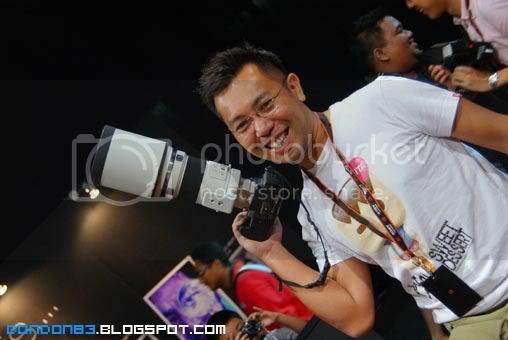 portraiture session, grab your camera and give a try here.trigger their lightning equipment. haihz.. mine failed to sync with their equipment that day. woot. the Models represent various country. a game session going on now. right here. don't miss it. 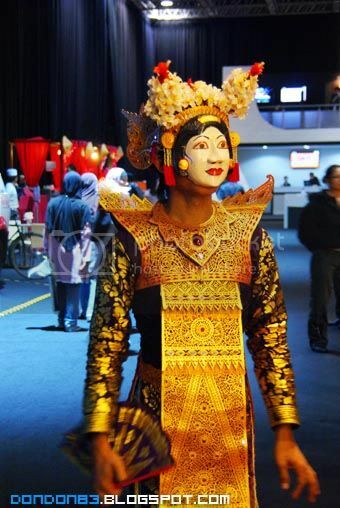 some random shot of the model in the convention. let me recall.. Japan, China and Vietnam? Dancer behind the stage. stand by for the dancing in next few minutes. and i happen to see this SHARK. 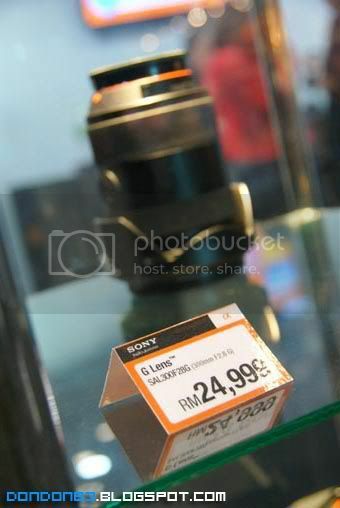 ops.. NEX-VG10, the e mount Video Camcorder, an interchange lens handycam camcorder from Sony. 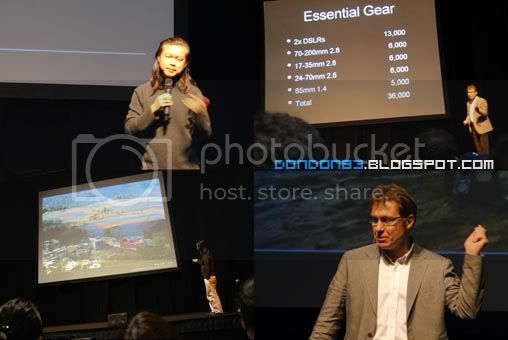 it shared all e mount Lenses, means it share Lenses with NEX Interchange lens Digicam Series. alpha series lens also, if add in an adapter for it. yupe. this couldn't be wrong. 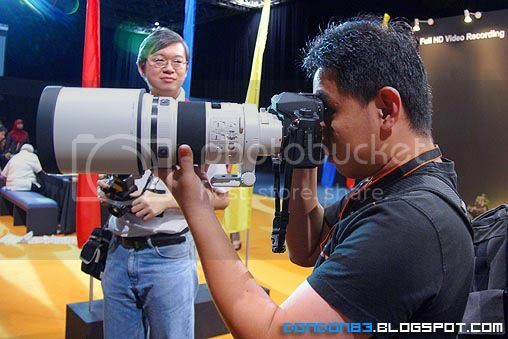 it's SONY 300mm f2.8G !! the ultimate rare lens. Albert trying to mount this giant beast into his tiny NEX Camera. 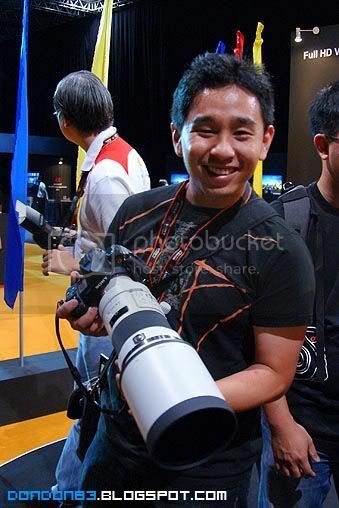 with his a mount adapter for NEX. 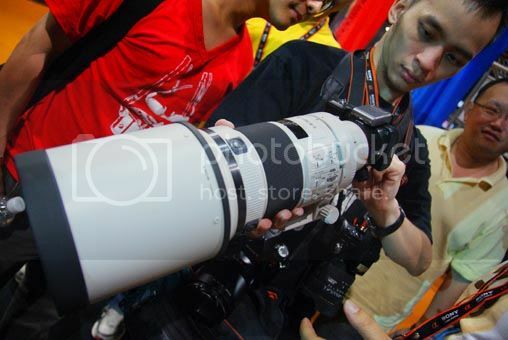 there you go, 300mm f2.8 G lens on NEX-3. almost can't see the camera from front view.the lens managed to fully covered up the camera. of course.. i don't want to miss a chance to play with this lens. hehehe. it's HUGE!!! 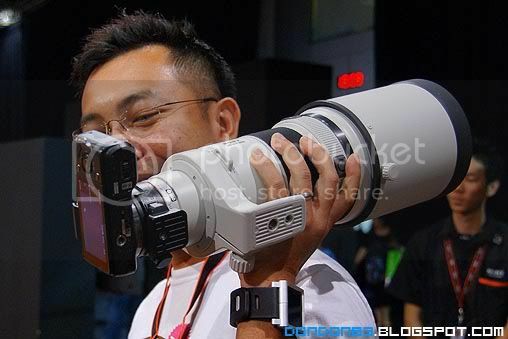 it make your dSLR look small. at first.. i though this lens would be incredibly heavy.. hardly lift it with a mono-pod.. turn out that i'm wrong.. it's lighter then what i'm imagine. i checked the specification of it. it weight 2.31KG. 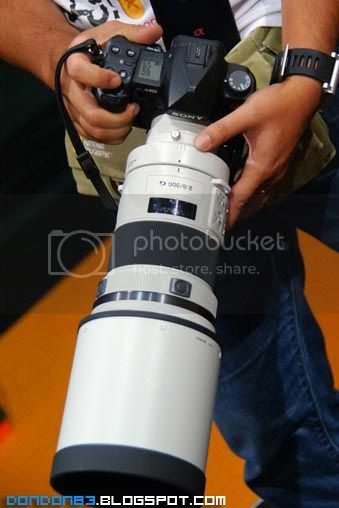 another front view of the 300mm f2.8G with sony alpha a850. look gorgeous. what? RM24,999? 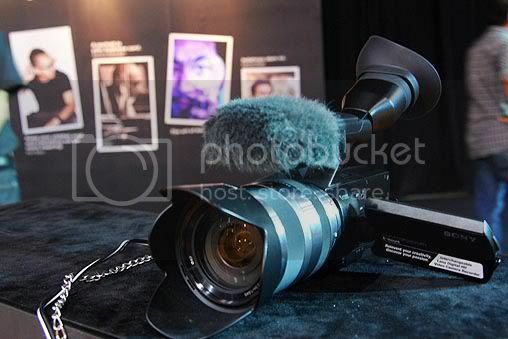 for the lense behind it? serious? of course not this is the price of the Giant white beast. someone put his Carl Zeiss 24-70 f2.8 there as a Mortgage for loaning the 300G lens out to breath some air. 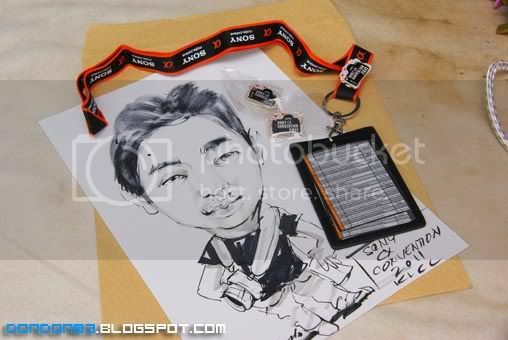 yupe.. that's all for Alpha Convention 2011. didn't get much freebies this time.. just a piece of my portraits scratch, 3 alpha convention badge. and tag. that all. 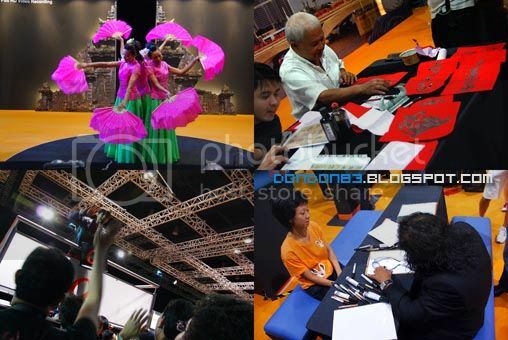 hope to see another Alpha Convention again :). What The Mouse ? ! ? !